Carbon dioxide emissions, rising global temperatures, melting ice caps and climate change make news on a daily basis. But is our love affair with carbon dioxide blinding us to the threat posed by a more dangerous agent? The global warming culprit in question is nitrogen, and ignoring it could lead to immense costs to both human health and the environment. Nitrogen is an essential part of life. Plants, animals and bacteria all use nitrogen in fundamental building blocks called amino acids, and these are joined together to make proteins. Proteins not only allow us to grow and function properly, but they form the basis of almost every chemical reaction in the human body. Our main source of nitrogen is the atmosphere, where it is present as nitrogen gas (formula N2). However in its gaseous form, nitrogen is very inert (unreactive) and only a small number of organisms are able to utilise it. The natural process of taking nitrogen gas and converting it into useful compounds is known as nitrogen fixation, and is carried out by nitrogen-fixing bacteria (and more occasionally, lightning). These 'fix' nitrogen into another nitrogen-containing compound: ammonia (NH3). Ammonia is more biologically accessible than nitrogen gas and is used by nitrifying bacteria to form nitrites (NO2-) and then nitrates (NO3-). These nitrates are the form of nitrogen that plants can process, and thus the form that introduces nitrogen into our food chain. But if all atmospheric nitrogen eventually ended up in plants or animals, there would soon be a shortage. Fortunately there are denitrifying bacteria that complete the cycle and convert nitrates back into the inert and unreachable N2. This cycle is naturally regulated by the speed at which bacteria can change one compound into another, and by the amount of bacteria available in the soil. In the past this led to a natural upper limit of nitrogen available for use in the biosphere at any one time. However, technological advances have dramatically increased this natural limit, and the consequences have been far-reaching. So what happened? The dawning of the Industrial Revolution heralded a major change that greatly affected the nitrogen balance. Large-scale burning of fossil fuels such as coal and oil released high levels of nitrogen oxides (including nitrous oxide or N2O) as fumes. The nitrogen problem escalated further by World War I with the development of the Haber-Bosch Process, which allowed inert N2 gas to be made into ammonia without the use of slow nitrogen-fixing bacteria. The ammonia produced became a valuable resource and could be used to make cheap fertilisers for use on crops. Other contributors to increased levels of nitrogen compounds were the burning of trees and plants for agriculture, and the manufacture of nylon. But seeing as successful industry and agriculture are crucial across the globe, do we really want to stop artificially creating our own useful nitrogen compounds? Why would we want to go back to the natural limits of the nitrogen cycle? There are two main things that these nitrogen compounds affect: the environment and human health. When nitrous oxide (N2O) reaches the stratosphere it helps destroy the ozone layer, resulting in higher levels of UV radiation and increasing the risk of skin cancer and cataracts. Ironically, when N2O is nearer to the Earth's surface it can actually make ozone, which can become smog on a still and sunny day. Smog has been linked to respiratory problems, lung damage, increased risks of cancer and a weakening of the immune system. 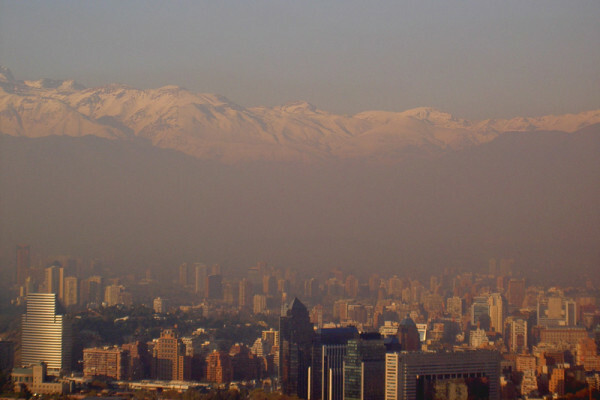 Smog over Santiago in Chile. This can be caused by nitrogen oxides in the atmosphere. As well as its tricks with ozone, nitrogen oxides dissolve in atmospheric water to make acid rain, which corrodes stone and metal work and damages buildings. In 1967 a bridge over the Ohio River collapsed due to acid rain corrosion, killing 46 people. But it's not only building damage that's cause for concern; plants (including our food crops) and even humans are at risk. Links between acid rain, Alzheimer's disease and brain damage have been suggested, as well as with many respiratory problems. So, overall, not good news! But the problems extend further. The overuse of fertilisers on fields and of nitrogen compounds in animal feed leads to nitrogen leaching into streams and rivers. Algae, whose growth is usually limited by nitrogen availability, use this flood of nitrogen to grow out of control, leading to big algal blooms. These use up all the oxygen in the water and block out the light, suffocating aquatic life and preventing underwater plants from photosynthesising. Worryingly, nitrate levels in the Norwegian lakes have doubled in the last ten years, and in northern Europe we are depositing nitrogen compounds at over 100 times the natural rate. The outlook for these lakes seems bleak. Returning to the land, higher nitrogen levels in the soil mean that a few plants are able to out-compete the rest. These tend to be plants able to quickly utilise the excess nitrogen for rapid growth, leaving fewer resources and more shade for other species. This can lead to many species of plant becoming extinct, and will in turn have knock-on effects on all the animals, insects and birds that use them. Many species-rich heathlands in the Netherlands have been taken over by species-poor forests for precisely this reason. Finally, nitrogen oxides contribute to global warming. Although the concentration of nitrous oxide in the atmosphere is considerably lower than that of carbon dioxide, the global warming potential of nitrous oxide is over 300 times greater. So although carbon dioxide causes climate change and its associated problems, nitrogen compounds are arguably worse. They have a greater global warming potential, could lead to more exaggerated climate change problems, and cause havoc with health and the environment to boot! So what can we do about it?